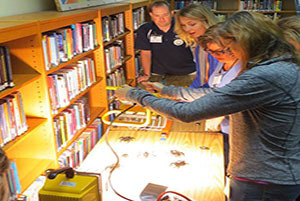 From Iowa prairies and water quality to soil and energy, Iowa teachers have the opportunity to learn how to better prepare themselves to teach these and similar subjects as part of annual Environmental Issues Instruction (eii) workshops. Issue Exploration ­ – The teachers learned the difference between a problem and an issue through the use of “The Lorax” by Dr. Seuss. The story was analyzed and the teachers closely examined their fellow players’ respective points of view and motivation. Other activities in this level helped the participants understand the motivating factors of why people make the choices that they do. Ecological Foundations – The participants learned the scientific concepts related to energy. Examples of the guidance offered were: What is energy? Where does energy come from? How do we use energy? How does the energy usage of the U.S. compare to other nations? What are some eco-friendly sources of energy? How can we reduce our use of energy? Among the hands-on and engaging activities were the development and/or utilization of a vortex cannon, solar cars, and solar ovens. Issue Study – The participants studied real energy issues such as food vs. fuel and fracking. The issues were analyzed similar to those in the exploration model. Responsible Environmental Action – This problem-based learning model included the study of energy test results to help solve environmental issues. Upon returning to their respective schools, the participating eii teachers and their students develop an action plan based on the environmental issue. Following the energy theme, many conduct home energy audits and from the results develop plans to reduce the use of energy in their homes. “From research and our experiences over the years, we’ve learned the teachers most frequently implement activities they have completed themselves in our workshops,” the administrator noted. “By having (St. Paul) teachers from almost every grade level participate in this summer’s workshop, our students will benefit from the additional hands-on activities and teacher collaboration among the grade levels.